Facial serums are silky and light oil-based preparations that are used to nourish and protect the skin. A few years ago, I created a self-heal serum recipe that I used for years. Last year I decided it was time for a new recipe. About that same time I was doing research for an herb monograph on St. John’s wort for HerbMentor.com. As part of the research for that article, I talked to several people who had used St. John’s wort topically to address pre-cancerous cells. I was intrigued! In my youth, I was not always careful about avoiding sunburns, and there was a time when I lived in the Dominican Republic where I got lots and lots of sun on my skin for many months. Using St. John’s wort oil topically to protect my skin seemed like a great idea. Often blooming around the summer solstice, St. John’s wort has a poetic and complex relationship with the sun. In modern times, St. John’s wort is often pigeon-holed as the “depression” herb. 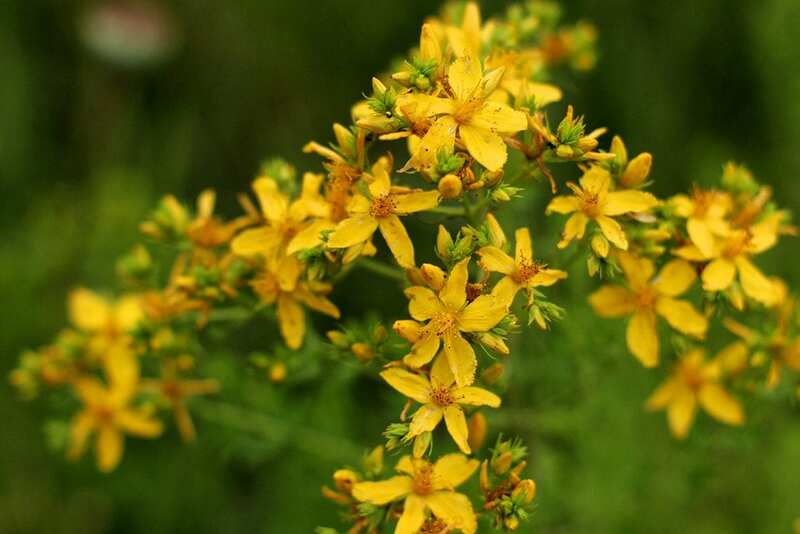 While there are an impressive number of clinical trials focusing on using the herb for depression, for many herbalists (myself included), St. John’s wort is a minor herb for depression. When I think of St. John’s wort, I first think of its ability to address viral infections like Herpes simplex or to abate nerve pain like sciatica. It is also known for protecting the skin against sun damage. However, there is a degree of controversy surrounding St. John’s wort and its ability to protect people from the sun vs. increasing the negative effects of the sun. As is often the case, the reason for the controversy stems from complexity. Many herbalists use an infused oil of St. John’s wort topically to protect their skin from the sun, as a mild sunscreen of sorts. This protective action can probably be attributed to St. John’s wort’s excellent anti-inflammatory and vulnerary effects. However, there have been several case studies showing that internal use of St. John’s wort increased photosensitivity, leading to blisters and severe burns. Topically using St. John’s wort infused oil can be a mild protectant from the sun. However, it would be ill-advised to attempt this on someone with fair skin who is suddenly getting unusual amounts of sun exposure. There are many different species of St. John’s wort. Most herbalists use Hypericum perforatum, but I am told that any St. John’s wort that stains your fingers red when crushed will work. There are many ornamental St. John’s worts that will not work, so be sure to give the finger crush test. Hypericum perforatum is native to Europe and parts of Asia but has now spread throughout the temperate regions of the world. It can grow anywhere from one to three feet in height. The yellow flowers are radially symmetrical with five petals. They have an obvious superior ovary with many stamens. The “perforated” leaves give this plant its species name. If you hold a leaf up to the light, you’ll see tiny black “holes” or oil glands in the leaf, giving it a perforated appearance. If you are unable to find St. John’s wort growing wild near you, you can often order it fresh from herb farmers or wildcrafters. Another option is to buy St. John’s wort infused oil from an herbalist or a company like Mountain Rose Herbs. When making a St. John’s wort infused oil you need to use the fresh or freshly wilted plant. I wouldn’t waste your time using dried St. John’s wort for oil, because it simply won’t work. I like to make an especially potent St. John’s wort infused oil by only using the young flower buds before they have opened. If you don’t have access to a lot of St. John’s wort, then you can also use the flowering tops including the uppermost leaves. To make the infused oil, I pick the buds from the plant and put them in a half-pint canning jar. I lightly pack the buds in the jar, filling it almost to the top. I then fill the jar with oil. For the facial serum recipe, I prefer to use jojoba oil because it is nourishing for the skin and it has a light, non-greasy feel. You can use any carrier oil of your choosing. Once you have the fresh St. John’s wort and the oil in the jar, stir it well and cover it with a tight fitting lid. While the flower buds are infusing, I place the jar in the sun. Visit the oil every day for several weeks to make sure all plants parts are below the surface of the oil. Some herbalists think that placing an oil in the sun increases its degradation, but while that rationally makes sense, I have always done St. John’s wort oil like this and have never experienced problems. In researching this article, I read that King’s American Dispensatory even recommends the solar infusion method. After several weeks, once the oil has turned to a brilliant dark red, strain off the flowers. The resulting oil can be used as is, or in the decadent recipe below. Also note that although the oil is often infused in the sun, once the herb has been strained off, it is best to keep it in a dark, cool location. Also known as everlasting or immortelle, this essential oil is well known for its ability to support skin health, reduce inflammation, and reduce pain. It is commonly used for minor injuries, such as bruises and contusions, and is also frequently used for scars. This is an expensive essential oil. I use it sparingly and a small bottle has lasted me for years. One of my favorite essential oils because of its lovely scent, lavender is also a wonderful choice for protecting and healing the skin. It has a long history of use for healing burns as well as infections. Rosemary antioxidant extract contains rosmarinic and carnosic acids, both extensively studied for their antioxidant qualities.23 It is often used in cosmetics to increase the shelf life of natural products. You can find rosemary antioxidant extract at herbal apothecaries. This face serum combines several sources of oils, extracts, and essential oils to create a deeply nourishing and restorative oil for the skin. I use it both morning and night on my face, neck, and shoulders. This blend is also ideal for healing scars. Add all the ingredients to a glass measuring cup with a pouring spout. Stir well. Pour the mixture into a 2-ounce glass jar. Cap with a lid. I prefer using a treatment pump bottle so I can easily dispense the oil. You could also put it in a traditional tincture bottle with a dropper, or any other small decorative bottle that seals well. Yield: This recipe yields approximately 2 ounces of oil. With daily application it should last about 3 months. 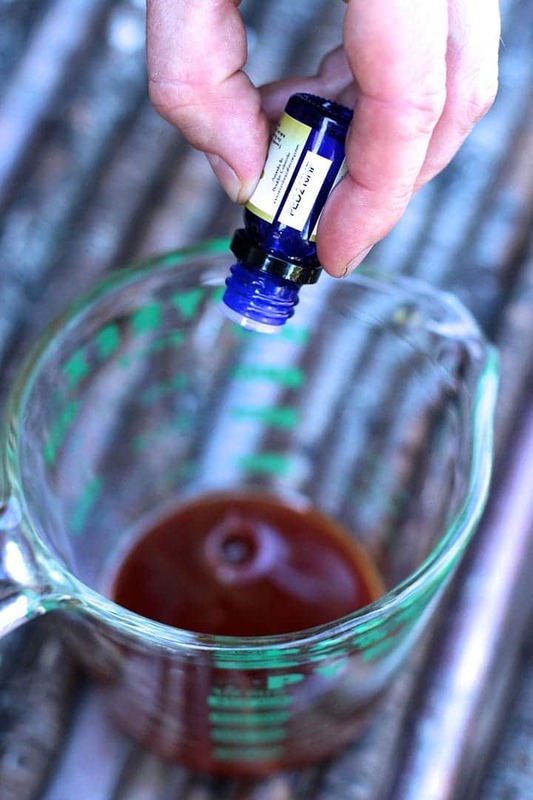 Have you ever made a remedy with St. John’s wort? What’s your favorite thing about this herb?